Neck arm pain also causes many shoulder and hand syndromes. Neck arm pain finds many shoulder and hand syndromes emanate from the cervical spine. I present here three letters received at the chiropractic help desk that will outline the gravity and seriousness of an ache and tingling radiating down the upper extremity from the cervical spine. They may help you to understand that you are not all alone. Hello, I am a 26 year old male who has been experiencing pain and tingling in the area where my neck and shoulder meet, along with tingling in the arms and hands, wrist and fingers. This has been going on for over a year now. I did data entry at my job for 5 years and that is where I first started experiencing discomfort in my hands, though most of my issues are on the right side. I have had 2 EMGs 8 months apart, 2 MRIs; one of the neck and one of the brain, an x ray of the neck, and cortisone injections in my wrists. The tests have all come back fine and I have seen many different doctors who can't seem to pinpoint an issue or come up with a diagnosis. The symptoms used to be only lower arm pain; in my hands and wrists so they thought it was CTS, but over time my symptoms have changed and worsened. I have experienced tingling in all of my fingers. My arms feel easily fatigued. I feel it is difficult to sit up straight, I can't sleep on my side anymore because my arm; from my armpit all around, and neck feel pain and tingling sensation, where it feels like I need to move to relieve it but no matter what way I move the arm it doesn't feel right. I'm only able to sleep on my back, though sometimes when I do (and I am unsure if this is related) from the top of my rear down to my toes I feel an uncomfortable numbness, but it doesn't happen all the time. I have been unable to work or enjoy my hobbies such as playing guitar, because any bit of work or activity I do seems to make them worse. Particularly the spot on my wrist and an area in my neck. Up until these problems I lead an active healthy lifestyle and exercised every other day by doing pull-ups, push-ups and lifting ten to thirty pound dumbbells, so I have always had good body strength. However, I have been unable to do this workout routine. Here is the second letter. Three months ago I fell down some steps at work and probably fell from a height of about one metre; I instinctively stuck my left arm out behind me. I came down fairly hard on the arm. This resulted in an intense burning sensation in the upper part of my arm lasting 10 minutes or there about. The incident was reported and I was checked by site safety officer and after 30 minutes all seemed ok and I returned to work. Two months later I started getting pain in the left arm like a dull ache in the upper part; I went to my GP he said it was probably just soft tissue damage, to give it a few days and see how it goes. After a week it had progressed to numbness and pins and needles sensation down the forearm across the hand and thumb and first 2 fingers and the dull ache in the upper arm which was now fairly constant. I have pins and needles starting in my finger tips and travelling up to my elbow. I cannot carry anything in my right hand without pins and needles beginning. Neck arm pain and shoulder symptoms call for a cervical spine examination as well as the heart; magnesium in spinach may benefit. I would say that the most challenging conditions at the Chiropractic Coalface concern neck shoulder arm pain. From the patient's point of view these conditions can be very disabling and to make matters worse they often seriously disturb sleep. Unlike a sciatica, you can't find a position to relieve the pain in the arm. Upper limb tension test ... for a pinched nerve in the neck. Obviously lower arm pain, for example, could be a local problem like arthritis in the fingers or if you fell an injury like a sprained wrist. Or the severe pain I'm suffering from after contact with a nasty rhus tree that gave me a very painful rash two months ago and the nerve pain is now waking me at night. I doubt an adjustment of the neck would help! A pinched or strongly irritated nerve root. The key sign is pain RELIEF when the arm is raised. The so-called Shoulder Abduction Relief sign. ARM PAIN ... a pinched nerve in the neck. Neck arm pain is such a huge subject that I've created another page on it. Chiropractic help is a site dedicated to helping you understand your neck arm pain better; a correct diagnosis is paramount. 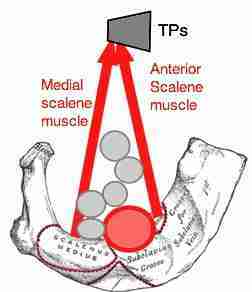 The Upper limb tension test is the gold standard test for a pinched nerve in the neck. One of the frustrations of neck arm pain is that the patient feels helpless. There appears to be nothing they can do to help themselves. Well there is. Provided the pain and tingling in arms and hands excludes the pinkie these Carpal Tunnel exercises MIGHT help, and certainly won't make it worse. Do them lying down if you have shoulder pain. "The radiographer angled the screen towards me so that I could see the corolla of dark tumours spiralling through my breast." If you have pain in the arm pit that you can't provoke by turning your neck, or raising your arm, then I'd see your medical doctor first. Just to be sure because it might NOT be the Neck Arm pain we have been discussing. The Subscapularis, Teres Major and Latissimus dorsi muscles are the usual causes of arm pit pain, but nasty swollen lymph nodes lurk there very occasionally. Every woman, in particular, should be looking to replace some of the animal protein - eggs, cheese, meat - in her diet with vegetable protein such as tofu and hummus, green beans and lentils. Research in the Netherlands, where one in eight women will get breast cancer, the highest in the world, is that too much animal protein is the chief cause, along with post-menopausal hormone replacement therapy. 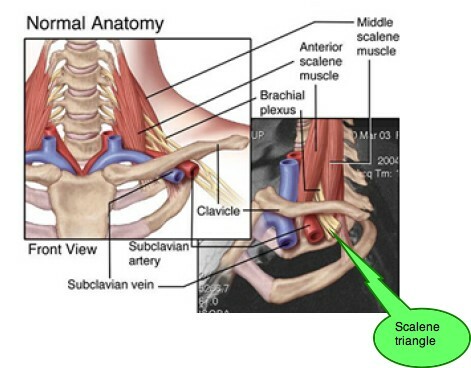 Ribs pertain normally to the thoracic spine, in the midback, but occasionally a very large one in the lower neck may interfere with the artery and nerves supplying the upper limb, causing a mystifying array of neck arm pain signs and symptoms for the clinician. The cervical rib casefile below may help you grasp the significance of a large cervical appendage. Small ribs are not uncommon and probably have little significance. If you have no interest in the problems and questions that others have regarding neck arm pain, then just scroll quickly down past several letters. It's the responsibility of all who are treating the patient with neck arm pain to help the patient make the right choices and decisions ... it's not the time for partisan politicking. If the patient is not responding well to Chiropractic help, then it's time for a second (medical) opinion, or even the opinion of another chiropractor. If the patient suffering from pain and tingling in the arms and hands is not responding well to anti inflammatory drugs then it's time for the medical doctor to consider whether a course of chiropractic adjustments may not be in the patient's interests. Often there's an arthritic component. Are there degenerative, inflammatory changes within the joints of Luschka? Would a course of fish oil and some of the findings from flax seed nutrition information to be considered. Omega-3 is a powerful anti-inflammatory. Hard choices have to be made sometimes. Healthy fats come mainly from three sources: avocado, olive and fatty fish. Of course, nuts and seeds, especially omega-3 rich flax seed.And omega-3 is vital if you suffer from joint pain, in general, more specifically from neck arm pain. Flax seed nutrition information ... the best plant source of omega-3. 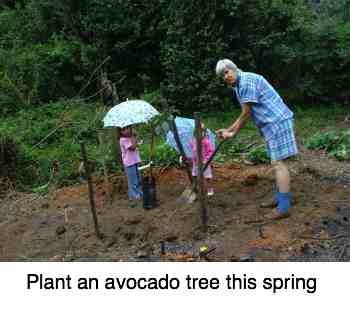 An miniature avocado tree will be such a blessing if you have the space. Not only is avocado fat rich in momo-unsaturated fatty acids, the good stuff, zero cholesterol, but an avocado-a-day contains all the beta-sitosterol (a phytosterol) a man needs to prevent nasty benign prostate enlargement. Nerves are coated in fat (called a myelin sheath), vital for conduction of nervous impulses. Diseases such a Multiple Sclerosis attack this fatty sheath, and a very low fat diet, or eating the bad fats, is strongly implicated in these very serious autoimmune diseases. Tingling in arms and hands in the absence of neck pain? What are phytosterols ... ? 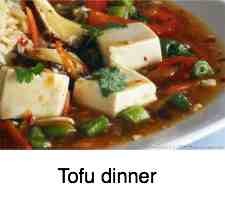 Tofu is the main source of protein in the East. It's an (unexciting) but extremely valuable source of vegetable protein, derived from the soya bean. But unlike soya bean burgers that I personally find detestable, tofu is perfectly palatable if you dickey it up with chillies, ginger and garlic. It's also a very cheap source of protein, try and eat Tofu nutrition at least once a week. 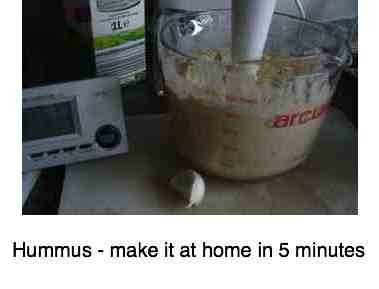 Hummus is a traditional Mediterranean dish made from chickpeas. Also known as Garbanzo Beans, chickpeas are the world's favourite legume. Hummus is quite expensive to buy, and often laden with chemicals such as preservatives, flavour enhancers... instead, I make a large tub twice a week in our own kitchen. It takes me less than five minutes from start to finish. Chickpeas are very cheap. Planning. Now is the time to decide just how much space you have in your garden for vegetables and fruit, remembering that FIVE colours in your diet every day is mandatory if you don't want to get cancer. The Black and White diet went out with B&W TV! If your space is limited, could I punt for growing green beans. 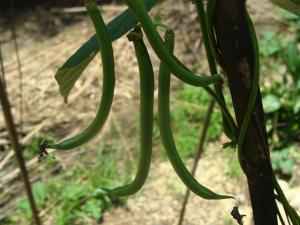 Just three or four pole bean seeds, planted every week or two will keep you in green beans right through the summer. They'll grow like weeds up any trellis work in a sunny spot in the garden, on a fence, up a stake... easy! And, once you have considered this green bean and lentil soup you WILL find a sunny corner for a few pole bean plants! In short, healthy eating is vital for sparkling good health, and especially a healthy nervous system. Don't expect to be healthy if you eat crap! A diet rich in magnesium, and of course many other minerals, phytochemicals and vitamins, is central in the management of arthritis; and there's no better place to get it than from fresh spinach recipes. It's really not entirely improbable that your neck arm pain has less to do with old whiplash injuries and more about your diet; fresh spinach recipes should certainly be weekly, if not daily, on the menu. Certainly we enjoy a dark green leafy vegetable every single day without fail; when did you last have spinach, kale, broccoli or arugula? Lettuce of course is great especially Cos, but Iceberg is bottom of the pile.